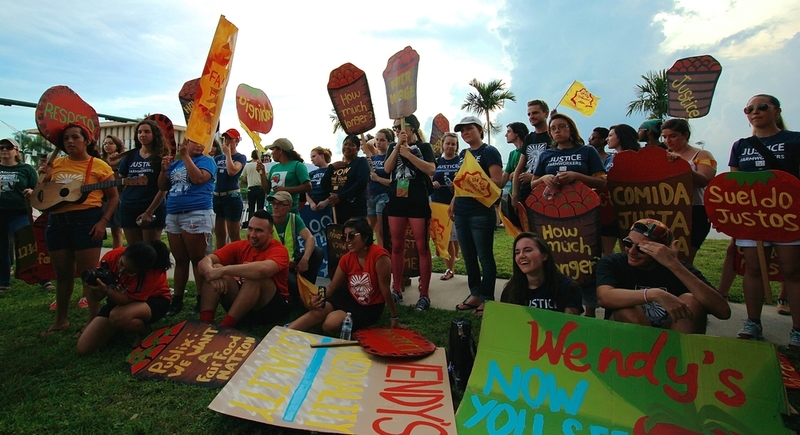 As the summer draws to a close and we enter the fall season, join the #FairFoodNation as we teach Wendy's a lesson on human rights, organizing pickets, theater pieces, marches and more within our universities, SFA Chapters and Fair Food Groups. As students continue heating up the national student boycott of Wendy’s, the entire Fair Food Nation will be “Schooling Wendy’s” on the many ways Wendy’s has failed to make the grade: dignified wages and working conditions, the prevention of violence and forced labor and respect for workers’ voices, just to name a few! We have 21 actions confirmed and counting! Check out the list below to join an action happening near you or contact us at organize@sfalliance.org to start planning your own. In order to support your organizing for the #SchoolingWendys Week of Action, we've put together this Resource Packet with all you need to start planning for your action, including a creative action packet, a how-to guide for writing op-eds, chant sheets and more!